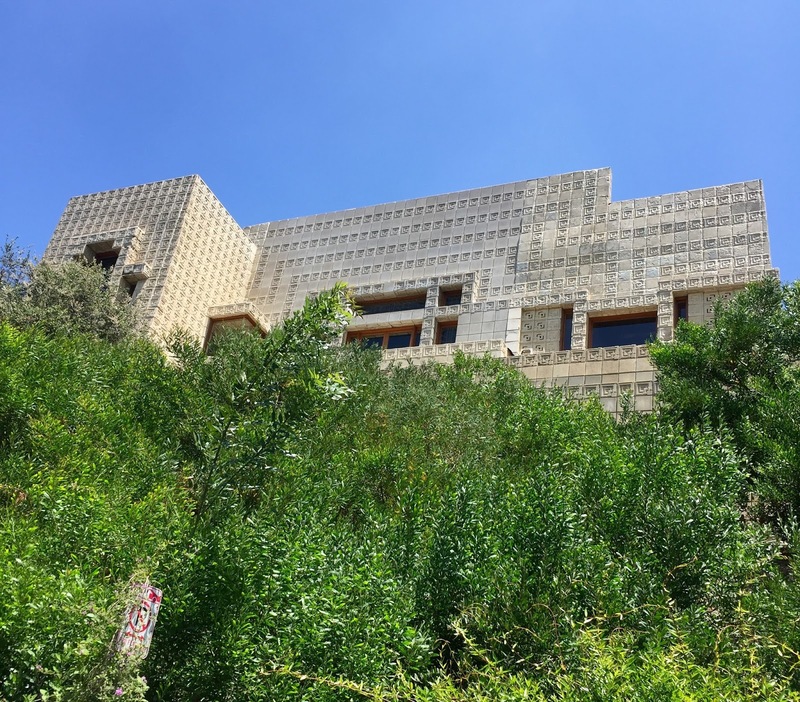 Scenes From A Hike: Frank Lloyd Wright's Ennis House | Gina Miller's Blog - A working mom's blog about fitness, travel, handbags & beauty. It's not every day you stumble across a Frank Lloyd Wright house while on a powerwalk. When you do, though, it's a magical moment and worthy of sharing. That's what so great about Los Angeles, you never what you might find. I am working in LA this month, serving as a sportscaster for the legendary CBS duopoly KCBS/KCAL. Working most nights until at least 11pm, I spend my days getting to know the greater LA area which includes a fair amount of hiking in Griffith Park's trails or hoofing it in the hilly streets of Los Feliz. I am also a house nut, primarily obsessed with architecturally significant homes. Plainly put: beautiful and interesting homes make my architecture pants go crazy. This city is a treasure trove for house lovers and today might have been a holy grail experience. That's exactly what happened Friday morning. While heading home, I came around a bend on Glendower and immediately noticed Wright's signature concrete blocks. These resembled the Arizona Biltmore, a hotel project on which Wright consulted with his former student, Albert Chase McArthur. I knew there were a few Wright homes in the area but didn't know where they were located. Trying to be nonchalant, I whipped out my iPhone and started snapping pics. At that point, I heard cheers coming from one of the home's patios. The crew working on the house seemed to be having a pre-lunch meeting which reminded me of one of those Wal-Mart pre-shift meetings in which everyone cheers, stomps and pumps up each other. Hey, whatever motivates your team. I started Googling on my way back home and learned this structure is the famous Ennis House, a home Wright designed for Mabel and Charles Ennis in 1924. It's the largest of Wright's four textile block houses in LA that feature those signature patterned and perforated concrete blocks. More than 27,000 concrete blocks were used to create this house which spans more than 6,200 square feet when you include the chauffeur's quarters. Crazily enough, it's only a two bedroom! 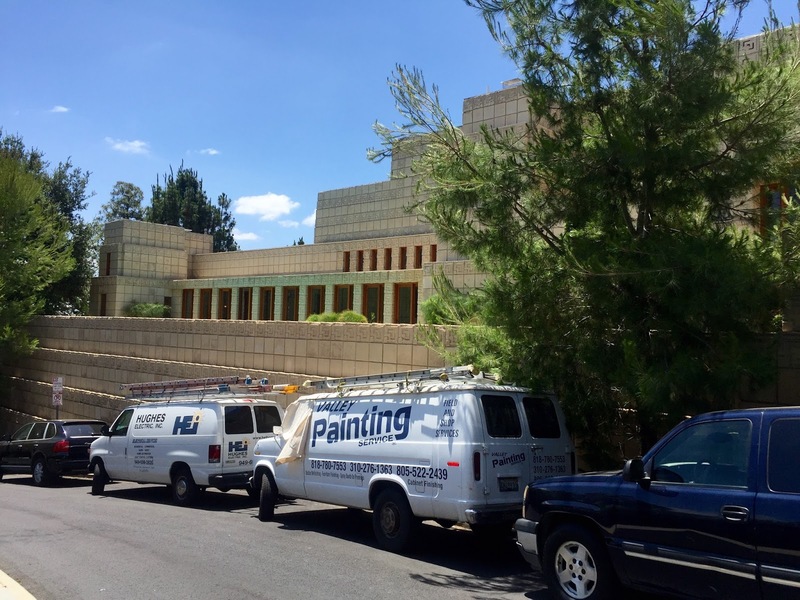 Like many old homes that require expensive upkeep, Ennis House suffered from deferred maintenance and fell into disrepair. In 2011, billionaire Ron Burkle bought the home for just under $4.5 million, down from an initial sale price of $15 million in 2009. He committed to restore it, hence the trucks, vans and workers. The home is open the public a minimum of 12 days per year, according to a conservation easement held by the Los Angeles Conservancy. You can purchase tickets to tour the home on September 27, 2015 through LA's American Institute of Architects. Ennis House has served as a location for movies and TV shows like "Blade Runner", "Black Rain", "Buffy the Vampire Slayer" and "Twin Peaks". There are three other Wright textile block houses in Los Angeles: Millard House, Freeman House and Storer House. Here is a complete list of Frank Lloyd Wright homes in Los Angeles. Click here for a map of those homes. Some people love Frank Lloyd Wright's architecture. Others? Not so much. I'm in the middle. I respect the brilliance of his work but it's not my favorite style. Knowing their homes firsthand, I am a huge fan of Clifford Hutsell's Spanish Colonial style, Charles Dilbeck's whimsy or Sir Alfred Bossom's English Tudors. What architectural styles or architects do you love? Have an LA house I should see? 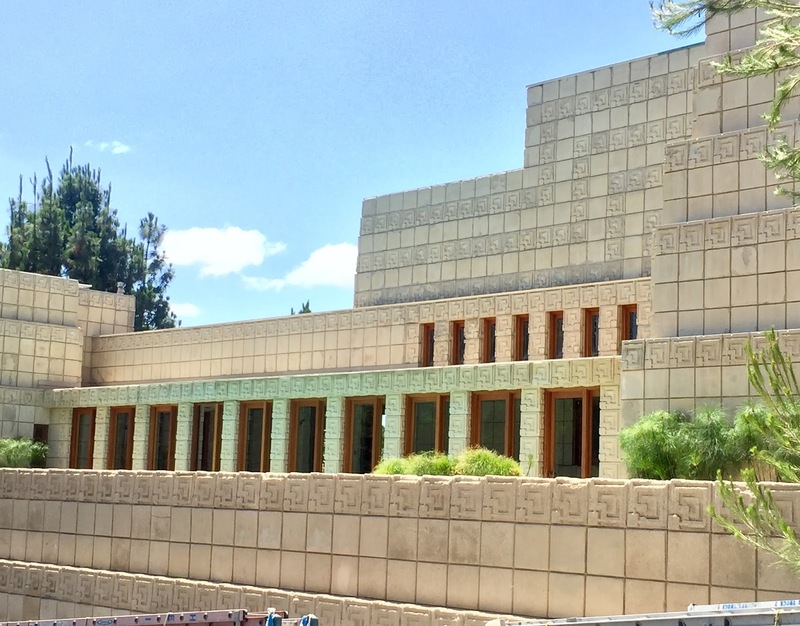 Have you experienced Ennis House or another Frank Lloyd Wright structure? Please let me know in the comments section.